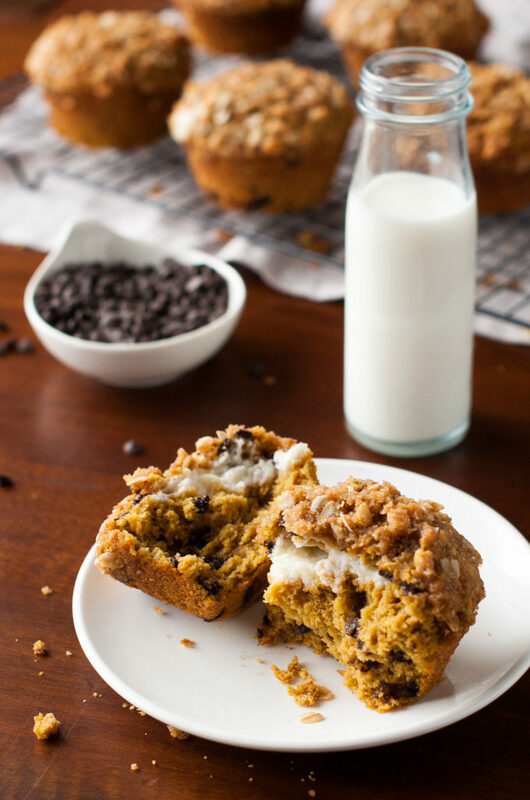 My gluten-free pumpkin chocolate chip muffins recipe with cream cheese filling and streusel topping is rich and decadent and just what you’ve been craving. Alright, folks! I was drooling the whole time I was making these quinoa pumpkin muffins and couldn’t wait to eat them. I was NOT disappointed with the results and was so excited because they are full of good ingredients for me! This is a gluten free pumpkin chocolate chip muffins recipe, but because of the filling, chocolate chips and topping you could eat them for breakfast, a snack or dessert. They don’t take that long to pull together and the fun surprise of cream cheese in the middle is not only rich and decadent, it’s similar to the frosting you put on carrot cake, which is my favorite all-time frosting. You have frosting inside the muffin and the streusel on top, so it’s sort of like two toppings in one muffin. If you want to make them more appropriate for breakfast, you can always just leave out the filling and topping. 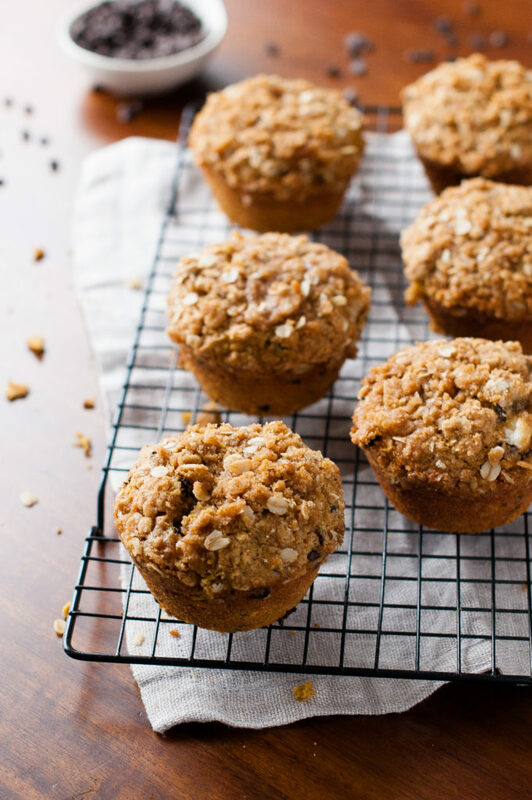 My children loved these muffins and were so excited to have them in their lunch box. I gave each of them one of these, some bacon and let them each pick their favorite fruit and vegetable. It’s sweeter than I normally let them eat for lunch, but it’s fun to have a little treat every once in a while in their lunch. This is a perfect fall or holiday recipe. I might just have to make these again here soon and have some hot chocolate while I read! Please let me know if you like these muffins and what you eat them with and what time of day you eat them. I made jumbo, bakery style muffins but regular would obviously work the same(and I wrote the recipe for regular sized muffins). I thought the jumbo would be fun for the pictures, though. I thought these were the best muffins I’ve ever had. Preheat the oven to 350 degrees. Grease or line a muffin tin with baking wrappers. In a large bowl, whisk together the quinoa flour, tapioca starch, baking powder, baking soda, salt, and oats. In another mixing bowl, whisk together the brown sugar, eggs, pumpkin puree, apple sauce, vanilla and milk until smooth. Mix the wet ingredients with the dry ingredients until just combined. Add the chocolate chips and mix in until distributed. Set aside. In another bowl, beat the softened cream cheese, cinnamon oil, and powdered sugar together until smooth and creamy. Set aside. In another bowl, mix together the brown sugar, oats, quinoa flour and cinnamon. Cut the butter in with your fingers until it resembles fine crumbs. Fill each muffin well(about 14) ½ way with pumpkin muffin batter. Divide the cream cheese mixture between the muffins, placing on top of the batter. Divide the remaining muffin batter between the muffin wells, placing over the top of the cream cheese. 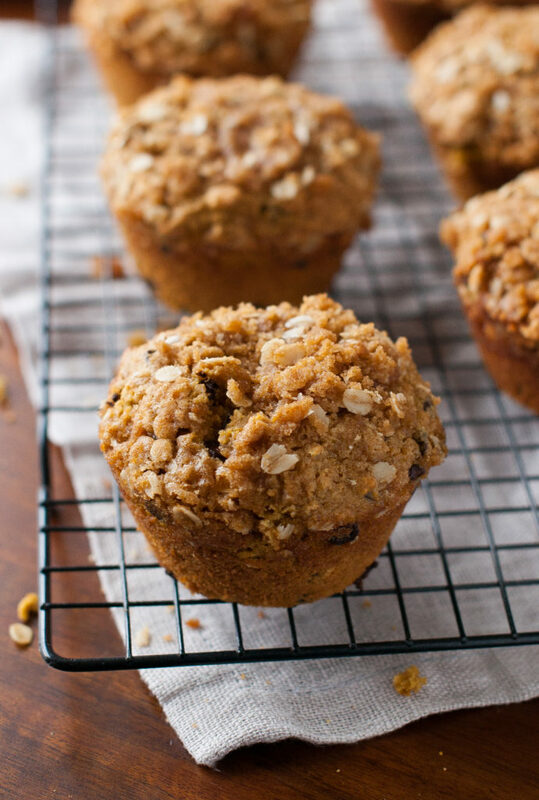 Sprinkle the streusel topping over evenly over the top of the muffins. Bake in the preheated oven for 18-20 minutes, or until puffed and firm on top. These seriously sound amazing. If it has pumpkin in it, I’ll definitely love it! These sound delicious – will definitely be baking them this weekend! I’m so curious to try to try these out since I’ve never used quinoa in a dessert before! I bet it’s great with pumpkin. Can I grind down my quinoa to make my own flour? These muffins look delicious! I’ve never heard of quinoa flour before. Can it be purchased, or do you need to grind your own quinoa into flour?